“Scooters are for kids aren’t they?” I’ve received mixed responses since bringing my new scooter into the office but it doesn’t bother me one bit. My commute to work used to be a minefield of car dodging, maneuvering between buses and avoiding those pesky white vans but since I swapped my bike for a scooter I haven’t looked back. Introducing the SwiftyOne, my new method of transport. I came across Swifty Scooters when searching for bikes online and after reading the positive reviews, decided to give it a go. Scooters are legal to ride on the pavement but living in London, pavements are often bumpy and broken. 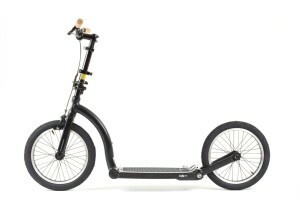 The SwiftyOne has 16 inch wheels which provide a surprisingly smooth and fast ride. It’s also light weight so you can take it pretty much anywhere. There’s been a few wet mornings when i’ve decided to jump on the bus but my folded Swifty comes with me for the journey home. It’s not just the commute that I use the scooter for. Meeting mates is easy, the SwiftyOne works on grass as well so when the sun is beating down and everyone is splayed out on Clapham Common I can easily scoot on over. Some people have been shocked at the £499 price tag but it’s cheaper than you would pay for a good quality bike. So far i’ve had the SwiftyOne for 4 months and it still rides as good as the first time I jumped on. One thing you do have to be careful of is making sure that you keep an eye out for fellow pavement users. I’ve had a couple of close calls when going at a speed that was probably inappropriate. It doesn’t fit into your handbag but when you fold it, unlike most other scooters/bikes, you can actually wheel it along on the back wheel. It’s just like a small suitcase. True, you might get a few funny looks from people, I have, but most people are inquisitive. There’s been a few times on the tube when people have asked how I ride such a small bike, when I explain that it is a scooter people often what to know more. Despite any worries you may have, I reckon your friends will be asking for a go before they start questioning your Swifty. I wanted to share this hidden gem with you guys because I know there will be other people out there that have had enough of the dangerous cycle to work. Be a trendsetter and give the Swifty a go, you won’t look back. Felix Dorling has become a UK scooter enthusiast and is sharing his new found passion via the-vu. Pavement in UK English is Sidewalk in US English. It may be illegal to scoot on the sidewalk where you are. Check local laws. 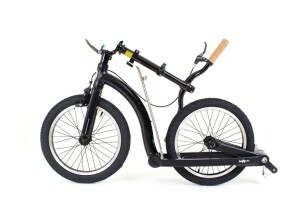 The SwiftyOne is designed for the road and is not intended to be all-terrain but happens to be also rideable on grass. Do you know whether I can ‘test-drive’ one before I commit? The author may not see your comment as this article is quite old, but don’t worry, the brakes on the Swifty are adequate for any steep hill. Thank you – that’s helpful!